The Uffington White Horse is a highly stylised prehistoric hill figure, 110 m (360 ft) long, formed from deep trenches filled with crushed white chalk. 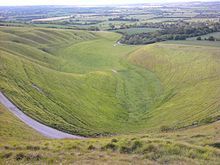 The figure is situated on the upper slopes of White Horse Hill in the English civil parish of Uffington (in the ceremonial county of Oxfordshire and historic county of Berkshire), some 8 km (5 mi) south of the town of Faringdon and a similar distance west of the town of Wantage; or 2.5 km (1.6 mi) south of Uffington. The hill forms a part of the scarp of the Berkshire Downs and overlooks the Vale of White Horse to the north. The best views of the figure are obtained from the air, or from directly across the Vale, particularly around the villages of Great Coxwell, Longcot and Fernham. The site is owned and managed by the National Trust and is a Scheduled Ancient Monument. The Guardian stated in 2003 that «for more than 3,000 years, the Uffington White Horse has been jealously guarded as a masterpiece of minimalist art.» The Uffington Horse is by far the oldest of the white horse figures in Britain and is of an entirely different design from the others inspired by it. The figure was presumed to date to «the later prehistory» — the Iron Age (800 BC–AD 100) or the late Bronze Age (1000–700 BC). This view was generally held by scholars before the 1990s, based on the similarity of the horse’s design to comparable figures in Celtic art. This theory was confirmed following a 1990 excavation led by Simon Palmer and David Miles of the Oxford Archaeological Unit: deposits of fine silt removed from the horse’s ‘beak’ were scientifically dated to the late Bronze Age, sometime between 1380 and 550 BC. They also discovered the figure was cut into the hill up to a metre (3 ft) deep, not simply scratched into the chalk surface. Iron Age coins that bear a representation comparable to the Uffington White Horse have been found, supporting the early dating of this artefact. Darvill (1996) dismisses as «folklore» the suggestion that the horse had been fashioned in the Anglo-Saxon period, more particularly during Alfred’s reign: there is no evidence to support this. If regular cleaning is halted, the figure quickly becomes obscured; it has always needed frequent work for the figure to remain visible. Periodic scouring continues, organized by the National Trust: on chalking day volunteers with hammers, buckets of chalk, and kneepads kneel and smash the chalk to a paste, whitening the paths cut in the grass inch by inch. During the Second World War the figure, easily recognizable from the air, was covered over with turf and hedge trimmings so that Luftwaffe pilots could not use it for navigation during bombing raids. In August 2002 the figure was defaced with the addition of a rider and three dogs by members of the «Real Countryside Alliance» (Real CA). The act was denounced by the Countryside Alliance. Soon afterwards for a couple of days in May 2003, a temporary hill figure advertisement for the fourth series of Channel 4‘s series Big Brother was controversially placed near the figure. In March 2012, as part of a pre-Cheltenham Festival publicity stunt, a bookmaker added a large jockey to the figure. It has long been debated whether the chalk figure was intended to represent a horse or some other animal, such as a dog or a sabre toothed cat. However, it has been called a horse since the 11th century at least. A cartulary of Abingdon Abbey, compiled between 1072 and 1084, refers to «mons albi equi» at Uffington («the White Horse Hill»). The head of the horse, with sheep grazing around it. The horse is thought to represent a tribal symbol perhaps connected with the builders of Uffington Castle. It is similar to horses depicted on Celtic coinage, the currency of the pre-Roman-British population, and on the Marlborough Bucket (an Iron Age burial bucket found in Marlborough, Wiltshire). Another theory proposed by University of Southampton archaeologist Joshua Pollard points to the horse’s alignment with the sun, particularly in midwinter when the sun appears to overtake the horse, to indicate that it was created as a depiction of a «solar horse«, reflecting mythological beliefs that the sun was carried across the sky on a horse or in a chariot. The most significant nearby feature is the Iron Age Uffington Castle, located on higher ground atop a knoll above the White Horse. This hillfort comprises an area of approximately 3 hectares (7.4 acres) enclosed by a single, well-preserved bank and ditch. Dragon Hill is a natural chalk hill with an artificial flat top, associated in legend with St George. Whitehorse Hill is designated a Site of Special Scientific Interest (SSSI). It is a geological SSSI due to its Pleistocene sediments, and a biological SSSI as it has one of the few remaining unploughed grasslands along the chalk escarpment in Oxfordshire. To the west are ice-cut terraces known as the «Giant’s Stair». Some believe these terraces at the bottom of this valley are the result of medieval farming, or alternatively were used for early farming after being formed by natural processes. The steep sided dry valley below the horse is known as the Manger and legend says that the horse grazes there at night. The Blowing Stone, a perforated sarsen stone, lies in a garden in Kingston Lisle, two kilometres away and produces a musical tone when blown through. Wayland’s Smithy is a Neolithic long barrow and chamber tomb 1.5 miles (2.4 km) southwest of the Horse. It lies next to The Ridgeway, an ancient trackway that also runs behind Uffington Castle, and is followed by the Ridgeway National Trail, a long-distance footpath running from Overton Hill, near Avebury, to Ivinghoe Beacon in Buckinghamshire. 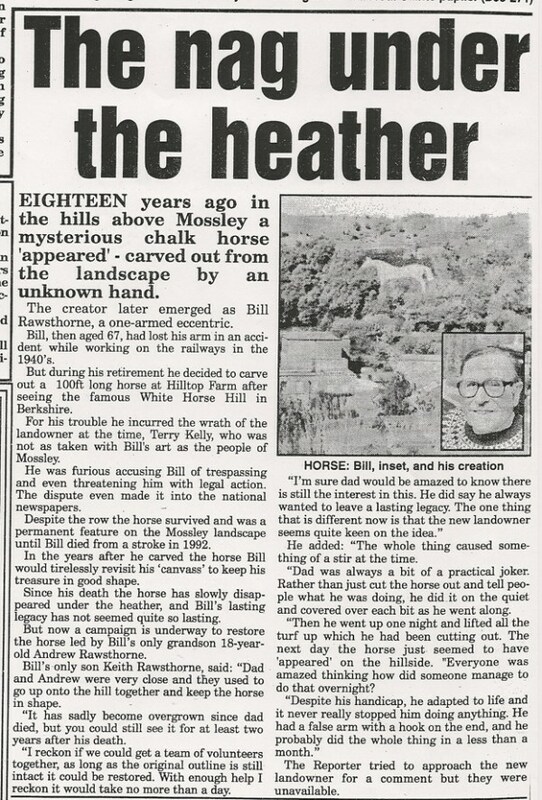 The horse was a direct influence on much later hill figures of white horses, including Kilburn White Horse (1858) in Yorkshire Folkestone White Horse (2003) in Kent, and a white horse cut from heather that existed from 1981 until the mid-1990s in Mossley, Greater Manchester. The first Westbury White Horse, which faced left, is also believed to have been inspired by the Uffington horse. Uffington White Horse has also inspired lookalike hill figures, including one facing left in Ciudad Juárez, Mexico. Direct replicas of the Uffington horse can be found at Cockington Green Gardens in Australia and Hogansville, Georgia, USA. Uffington White Horse has also inspired two sculptures in Wiltshire, namely Julie Livsey’s White Horse Pacified (1987) in the nearby Swindon, a town which was also once considered for a white horse, and Charlotte Moreton’s White Horse (2010) in Solstice Park, Amesbury. The White Horse is used as a symbol by diverse organisations (mostly with Oxfordshire or Berkshire connections) and appears in numerous works of literature, visual art and music. The White Horse is the emblem of the Vale of White Horse District Council, the Berkshire Yeomanry (a Territorial Army unit based in Windsor, Reading and Chertsey), and educational establishments including Faringdon Community College and The Ridgeway Primary School in Whitley, Berkshire. Thomas Hughes, the author of Tom Brown’s Schooldays, who was born in the nearby village of Uffington, wrote a book called The Scouring of the White Horse. Published in 1859, and described as «a combined travel book and record of regional history in the guise of a novel, sort of», it recounts the traditional festivities surrounding the periodic renovation of the White Horse. G. K. Chesterton also features the scouring of the White Horse in his epic poem The Ballad of the White Horse, published in 1911, a romanticised depiction of the exploits of King Alfred the Great. In modern fiction, Rosemary Sutcliff‘s 1977 children’s book Sun Horse, Moon Horse tells a fictional story of the Bronze Age creator of the figure, and the White Horse and nearby Wayland’s Smithy feature in a 1920s setting in the Inspector Ian Rutledge mystery/detective novel A Pale Horse by Charles Todd; a depiction of the White Horse appears on the book’s dust jacket. The horse is also central to the 1978 BBC Television serial The Moon Stallion by Brian Hayles, who later novelised the series. David Bedford‘s Song of the White Horse (1978), set for ensemble and children’s choir and commissioned for the BBC‘s Omnibus programme, depicts a journey along a footpath alongside the Uffington Horse and includes words from Chesterton’s poem. The composition requires the choir to inhale helium to sing the «stratospherically high notes» of the climax, accompanied by aerial footage of the horse animated to show it rearing up from the ground. A recording, produced by Mike Oldfield, was released by Oldfield Music in 1983. The Uffington Horse is illustrated on the cover of English Settlement (1982), the fifth studio album by the Swindon band XTC, and appears (among other symbols copied from Barbara G. Walker‘s The Woman’s Dictionary of Symbols and Sacred Objects) on the back cover of Nirvana‘s final album, In Utero (1993). Historic England. 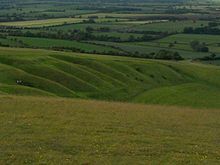 «The White Horse hill figure 170m NNE of Uffington Castle on Whitehorse Hill (1008413)». National Heritage List for England. Retrieved 15 February 2014. Townsend, Mark (4 May 2003). «Big Brother’s logo ‘defiles’ White Horse». The Observer. Retrieved 10 October 2015. «Wiltshire Uffington». Wiltshirewhitehorses.org.uk. 21 March 2010. Retrieved 23 April 2011. «Uffington White Horse». hows.org.uk. Retrieved 10 October 2015. Plenderleath, Rev W. C. (1892). The White Horses of the West of England. London: Allen & Storr. p. 8. Darvill, Timothy (1996). Prehistoric Britain from the Air. Cambridge University Press. p. 223. ISBN 0521551323. «Uffington White Horse». Atlas Obscura. Retrieved 15 July 2017. Cleaver, Emily (6 July 2017). «Against All Odds, England’s Massive Chalk Horse Has Survived 3,000 Years». Smithsonian.com. Retrieved 12 July 2017. «The Red Book of Hergest». maryjones.us. Retrieved 10 October 2015. «White horses defaced by activists». BBC News. 28 August 2002. Retrieved 23 April 2011. «Bookmaker adds jockey to Uffington Horse». BBC News. 9 March 2012. Retrieved 5 July 2017. Early Iron Age Horses on the Marlborough Bucket (exhibition label), Wiltshire Museum, … take a closer look at the sides of the bucket in order to identify Early Iron Age depictions of horses. They have similar features to the Uffington White Horse … In the past, this resemblance has been used to date the Uffington Horse to the Iron Age. However, it was actually created much earlier, and does not compare exactly to Iron Age representations of horses which are often much curvier in appearance. «Uffington Castle – White Horse and Dragon Hill». English Heritage. 16 April 2011. Retrieved 23 April 2011. «Whitehorse Hill citation» (PDF). Sites of Special Scientific Interest. Natural England. Retrieved 23 December 2013. «Map of Whitehorse Hill». Sites of Special Scientific Interest. Natural England. Retrieved 23 December 2013. «Royal Berkshire History: The Uffington White Horse». Berkshirehistory.com. Retrieved 23 April 2011. Historic England. «Wayland’s Smithy chambered long barrow, including an earlier barrow and Iron Age and Roman boundary ditches (1008409)». National Heritage List for England. Retrieved 15 July 2017. Curtis, Neil (1994). The Ridgeway National Trail Guide. ISBN 1-85410-268-0. Marples, Morris (1981) . White Horses and Other Hill Figures. Gloucester: Alan Sutton Publishing Limited. ISBN 0-904387-59-3. «The White Horse – More Details». whitehorsefolkestone.co.uk. Retrieved 10 October 2015. «The nag under the heather». Tameside Reporter. c. 1999. Retrieved 5 July 2017. «Wiltshire White Horses». wiltshirewhitehorses.org.uk. Retrieved 10 October 2015. «Tunis Horses». hows.org.uk. Retrieved 10 October 2015. «West Swindon sculpture walk – Part 3 – ‘White Horse Pacified'». swindonadvertiser.co.uk. Retrieved 10 October 2015. «Designs that Were Never Made». hows.org.uk. Retrieved 10 October 2015. «A white horse for Solstice Park – Western Daily Press». Western Daily Press. Retrieved 10 October 2015. «Vale of White Horse District Council». VOWHDC. Retrieved 14 June 2017. Doyle, Peter; Foster, Chris (20 July 2012). British Army Cap Badges of the Second World War. Bloomsbury Publishing. p. 56. ISBN 978-0-7478-1110-7. «Faringdon Community College». Retrieved 14 June 2017. «The Ridgeway Primary School». Retrieved 14 June 2017. «Uffington and Tom Brown’s Schooldays». Tom Brown’s School Museum. Retrieved 14 June 2017. Landow, George P. «A «Great Basket of Country Treasures»: Tom Hughes’s The Scouring of the White Horse». The Victorian Web. Retrieved 14 June 2017. Hughes, Thomas (1859). The Scouring of the White Horse; or, the Long Vacation Ramble of a London Clerk. Boston: Ticknor and Fields. Ford, David Nash (2003). «The Uffington White Horse Part 3: Scouring and Pastimes». Royal Berkshire History. Retrieved 14 June 2017. Annis. «Rosemary Sutcliff». Historical Novels. Retrieved 14 June 2017. Todd, Charles (2008). A Pale Horse: An Inspector Ian Rutledge Mystery. HarperCollins. ISBN 978-0-06-123356-2. Bramwell, Peter (31 March 2009). Pagan Themes in Modern Children’s Fiction: Green Man, Shamanism, Earth Mysteries. Palgrave Macmillan UK. p. 167. ISBN 978-0-230-23689-9. Hayles, Brian (1978). The Moon Stallion. The Book Service Ltd. ISBN 0859391345. «David Bedford’s The Song of the White Horse». BBC Radio 3. 5 November 2011. Retrieved 29 June 2017. David Bedford (Composer), Tony Staveacre (Director) (1978). The Song of the White Horse (TV). Omnibus. BBC. Retrieved 29 June 2017. Dalkin, Gary S. «David Bedford: Song of the White Horse also featuring Star Clusters, Nebulae & Places in Devon». musicweb-international.com. Retrieved 29 June 2017. Gaar, Gillian G. (2006). Nirvana’s In Utero. Continuum. ISBN 0-8264-1776-0. Benson, Robert (13 September 2009). «Album Cover Art Stories: Nirvana – In Utero». SoundStageDirect. Retrieved 29 June 2017. Bramwell, Peter (2009). Pagan Themes in Modern Children’s Fiction: Green Man, Shamanism, Earth Mysteries. New York: Palgrave Macmillan. ISBN 978-0-230-21839-0. Darvill, Timothy (1996). Prehistoric Britain from the Air: A study of space, time and society. Cambridge: Cambridge University Press. ISBN 0-521-55132-3. Dyer, J (2001). Discovering Prehistoric England. Oxford: Shire Books. ISBN 0-7478-0507-5. Miles, David; Palmer, Simon; Lock, Gary; Gosden, Chris; Cromarty, Anne Marie (2003). Uffington White Horse and its Landscape: Investigations at White Horse Hill, Uffington, 1989–95 and Tower Hill, Ashbury, 1993–4. Thames Valley Landscape Series. 18. Oxford: Oxford University School of Archaeology. ISBN 0-947816-77-1. Plenderleath, Rev. W.C. (1892). The White Horses of the West of England. London: Allen & Storr.